Elements of the International Business Machines 305 RAMAC system on display at the Exposition universelle et internationale de Bruxelles, unknown location. Anon., “Machine-histoire.” L’Action catholique, 18 January 1959, 15. Bonjour and goeidag, my reading friend. We are gathered here today to talk about science, technology and innovation in the field of computers rather than aviation and space. I can only imagine now how disappointed you are, but that’s life. Let me assure you that yours truly is not putting forward this topic out of love for computers. As far as I am concerned, these things are no more than temperamental typewriters, with as strong an emphasis as humanly possible on the word mental, but I digress. And yes, I once again strayed from the true path to enlightenment by using a source of topics other than the amazing library of the Canada Aviation and Space Museum of Ottawa, Ontario. This week’s topic burst out of the pages of L’Action catholique, a now defunct daily newspaper from Québec, Québec, that contained far more cool photos than I could ever have imagined. The one with which I intend to annoy you today came from the 18 January 1959 issue. Please find enclosed a transcript of the rather long caption of the photo that caught my eye. And yes, my reading friend, photo captions on text panels at the aforementioned Canada Aviation and Space Museum are a lot shorter than that, thanks to the, oh, so popular caption police. Just kidding, EP. Just kidding. Texts and captions on panels must be short. The age of automation could not produce a machine more historical than this one which evokes the events that occurred from four years before the birth of Christ until the launch of the first sputnik. By touching a few buttons, a historical summary, for any year and in one of the 10 languages known by the machine, appears on the board above the cabinet, on the right. The brain, in the background, contains disks mounted vertically on a rod that rotates at a speed of 1 200 revolutions per minute. Each disk has many magnetised points on its surface, each representing part of the information stored. The information contained in this caption led / leads me to believe that the apparatus on display had to do with the International Business Machines (IBM) 305 RAMAC system on display at the Exposition universelle et internationale de Bruxelles, or Expo 58. The items in the photo may even have belonged to that very example of the system, and… Why 4 years before the birth of Christ, you ask? Search me. In fact, the individuals in charge of the project may have believed that Christ was born earlier than it was thought, 4 years earlier in fact. All that yours truly knows is that the period for which visitors could obtain information went from the year 4 before the current era to 1957. And yes, my space nutty reading friend, Sputnik I was mentioned in July, August and September 2018 issues of our blog / bulletin / thingee. Held in Brussels, Belgium, between April and October 1958, Expo 58 was a highly successful world fair that welcomed no less than 42 million visitors. If truth be told, it was the first world fair held after the Second World War. The Cold War context that surrounded its creation led many of the 40+ participating countries, especially the United States and the Union of Soviet Socialist Republics (USSR), to go all out to impress visitors. All these efforts paid off, as visitors were both shocked and appalled. Sorry, sorry. They were left speechless by the wonders on display throughout the site. And yes, Canada had a pavilion at Expo 58. One of the aforementioned wonders was, you guessed it, the IBM 305 RAMAC system. As was said (typed?) above, the system answered questions in 10 languages, namely Dutch, English, French, German, Interlingua, Italian, Portuguese, Russian, Spanish and Swedish. What’s this I hear? You do not know what Interlingua was / is, my reading friend? No? Seriously? I did not know either, actually. Let it thus be known throughout the land that Interlingua was / is an international auxiliary language, in other words an artificial language, just like Esperanto, Ido, Novial, Occidental, Volapük, etc. A team of linguists began to develop it in 1937. A grammar and an English-Interlingua dictionary were published in 1951. An introductory manual followed in 1954. Interlingua proved surprisingly popular in the scientific community and, to some extent, among the public, which would explain its use by IBM at Expo 58. While it is true that people who speak French, Italian, Portuguese and Spanish could / can apparently read and understand Interlingua without having to study it, the number of active / regular speakers as of 2019 did / does not exceed 2 000 individuals. Before moving on, yours truly would like to point out that the 9 aforementioned non artificial languages were all alphabetic languages compatible with the technology of the day. Answering questions in Chinese would have been quite impossible. Most of these non artificial languages, namely Dutch, English, French, German, Italian, Portuguese, Russian and Spanish, were spoken by citizens of countries with pretty bloody colonial pasts. You have another question, don’t you, my inquisitive reading friend? You wish to know more about the IBM 305 RAMAC system on display at Expo 58? I thought so. This electronic brain, informally known as Professor RAMAC, was on display in the American pavilion. As one might expect at a time when scientific and technological discoveries attracted a lot of attention, it too attracted a lot of attention. If truth be told, the presentation of the IBM 305 RAMAC system at Expo 58 was nothing short of a stroke of genius for International Business Machines Corporation (IBM). Countless people who had never seen an electronic computer from up close watched in awe as an attractive young female operator explained how this stupefying gizmo worked. A visitor only needed to provide a date, seemingly a year. This date would then be entered, possibly by an operator, using a manual enquiry station. The IBM 305 RAMAC system then leapt into action, figuratively of course. It needed 0.6 second to find the requested information. This information went to a printer which typed the whole thing on a piece of paper. Our visitor, awed by the power of the American machine, walked away with said piece of paper. Many such answers may have survived to this day, in drawers or photo albums. - Mozart composed his first opera at the age of 11. Christian the 7th became king of Denmark. If yours truly may be permitted to use his red pen for a moment, or 2, it looks as if da Vinci invented his parachute between 1480 and 1483. The answer for the year 1917 had to do with the entry of the United States in the First World War, as well as the Great October Socialist Revolution, a world shaping / shaking event mentioned in May and July 2018 issues of our blog / bulletin / thingee. Yours truly included the answer for 1917 because a famous, or infamous, you decide, visitor of Expo 58 wanted to know what Professor RAMAC had to say about that year. This visitor was none other than Kliment Yefrimovich “Klim” Voroshilov. The elderly chairman of the Presidium of the Supreme Soviet, in other words the head of state / president of the USSR, nodded as he read the text printed by the good professor. Voroshilov lived through the revolution and the civil war that followed. He also lived through the terrible years during which Josif Vissarionovich Stalin, born Ioseb Jughashvili, ruled the USSR with an iron fist. And yes, my reading friend, the monster that was Stalin was mentioned in a February 2018 issue of our blog / bulletin / thingee. Voroshilov spent 50 or so minutes in the American pavilion, shaking hands with officials and slapping them in the back. He looked at many items on display and thoroughly enjoyed himself. Voroshilov was at Expo 58 to take part in special days dedicated to the USSR. Individuals who interacted with Professor RAMAC may, I repeat may, also have been able to ask one of the (1 200?) questions pre-programmed in the memory of what was for all intent and purposes the world’s first digital library. Crucially important questions like, which French language word was / is the most difficult to pronounce? Sigh. You have a question of your own, don’t you? No, I don’t know what that word was / is. Next question. What does RAMAC stand for, say ye? Well, this acronym stood / stands for Random Access Method of Accounting and Control. And yes, this somewhat cryptic expression will soon be explained. Before doing so, yours truly would like to point out that Professor RAMAC travelled to several / many IBM sales offices in the Unites States after the end of Expo 58. Let us now go over the meaning of the expression that so puzzled you a moment ago. The IBM 305 RAMAC system was a technical wonder, and quite a light one at that – only 3 600 or so kilogrammes (8 000 pounds). This super system consisted of a utility table, a processing unit, a printer, a power supply, a disk storage unit, a console and a card punch. It required very little space; a room slightly more than 9 metres (30 feet) wide and 15 metres (50 feet) long would be perfect. The 785-kilogramme (1 730 pounds) 50-disk random access storage unit had a capacity of, drum roll please, 5 million characters – a full 5 megabytes of data if my very basic and primitive calculations are correct. This technological wonder could be yours, my reading friend, for only $ 190 000 – forklift, cargo airplane and air conditioning system not included. Don’t wait any longer. This offer will end in, well, err, let me go ask. And no, I don’t know if the price mentioned above was for the entire system or just the processing unit. I do know, however, than a stand alone disk storage unit was worth $ 34 500. Incidentally, up to 3 additional units could be tagged on to a processing unit, if a customer needed a whole lot of cogitating power. The IBM 305 RAMAC system, my reading friend, was the first production electronic computer fitted with a disk drive / hard drive / hard disk drive. What’s so great about such a drive, you ask? What’s so great? Are you kidding? Oh, I see what your intentions are. You opened a door that would allow me to pontificate for a moment. How clever of you. How nice too. Thank you. Well, to make a short story long, before the introduction of the IBM 305 RAMAC system, electronic computers accessed their data sequentially, using stacks of punch cards or reels of magnetic tape. A hard disk drive made any piece of information as accessible as another. In other words, an IBM 305 RAMAC system could access its data randomly. The story of the hard disk drive, a world shaping / shaking invention if there was / is one, arguably began in 1952, when IBM opened a new advanced research laboratory in San Jose, California – far from the company’s main office. As 1953 began, the team was busy working on a new assignment: the development of an information storage medium that would outclass the punch card. You see, my reading friend, some / many IBM customers were discovering that sequential access to their data was no longer sufficient. They needed to access said data randomly. After looking at every punch card replacement idea in existence, the San Jose team came up with what seemed to be a winner. Why not store the data of an electronic computer on rapidly rotating stacks of magnetic disks that could be accessed, randomly of course, by read and write heads mounted on a mechanically-operated retractable arm? One of the engineers who played a crucial role in the development of this device was William A. “Bill” Goddard, an aeronautical engineer who had briefly worked for North American Aviation Incorporated, one of the great aircraft makers of the 20th century, and a company mentioned in an August 2018 issue of our blog / bulletin / thingee. And yes, my wing nutty reading friend, this was everything that yours truly will say (type?) about aviation or space today. Incidentally, the good folks at the San Jose research laboratory could have developed a disk storage unit with a capacity greater than 5 million characters. They seemingly did not do so because IBM’s marketing department all but vetoed the idea. The good folks there did not know how to sell a system with a capacity greater than 5 million characters, or so it was said by some, but let us move back to the track that will lead us to our train of thought. Some engineers at IBM thought the San Jose team was a few fries short of a “Happy Meal” when it set out to design the world’s first hard disk drive, and… I know, I know, this expression is anachronistic. Would you believe that an unknown wit at IBM referred to the proposed hard disk drive as a bologna slicer? Sadly enough, one of the rotating stacks of disks disintegrated during early trials, probably in 1955, wounding 2 engineers. Working in cooperation with other IBM research laboratories, the San Jose team assembled and tested 14 prototypes of what became the IBM 305 RAMAC system. The first of these went to Crown Zellerbach Paper Corporation in June 1956. The new system was officially introduced in September of that same year. IBM’s president was so pleased that he stated that this announcement was the greatest day in the history of the company. What’s this you say (type? ), my reading friend? A typical corporate overstatement, you say? Not in this case, say I. One could argue that the hard disk drive has played as important a role in the development of human-computer interaction as the mouse and graphical screen. Yours truly would not be able to annoy you on this day if it was not for the hard disk drive. A slightly amusing piece of information if I may. The first IBM 305 RAMAC systems may have been put together in a shed previously used by California Packing Corporation, a major food producer known today as Del Monte Foods Incorporated. Would you care for a second amusing, or is it ironic, piece of news, my long suffering reading friend? Crown-Zellerbach Paper was one of a leading producers of the light cardboard used to make punch cards, a product made obsolete by the … IBM 305 RAMAC system. How was / is that possible, you ask? Well, a single disk storage unit could contain as much data as 64 000 punch cards. Would you believe that, in the early 1980s, yours truly had the infinite pleasure of using punch cards for a couple of history classes at the Université de Sherbrooke in Sherbrooke, Québec, and at the Université Laval, in Québec? Oh, happy days. BLINK punch cards! By the time production of the IBM 305 RAMAC system ended, in 1961, more than 1 000 of these devices had been built. Did you know that some / many were built by International Business Machines Company Limited of Don Mills, a town located near Toronto, Ontario? The first IBM 305 RAMAC system made in Canada was completed in 1960. It was delivered to Bank Aufina Aktiengesellschaft, a Swiss consumer lending institution. The second one, yours truly thinks, went to L’Assurance-Vie Desjardins, an element of the Mouvement Desjardins known today as Desjardins Sécurité financière. You seem puzzled, my reading friend, have you not heard of the Mouvement Desjardins before? This organisation, a Québec institution if there ever was one, was / is the largest federation of credit unions in North America. This IBM 305 RAMAC system left Don Mills on 12 July 1960. It arrived at the headquarters of L’Assurance-Vie Desjardins, at Lévis, Québec, on the following day. 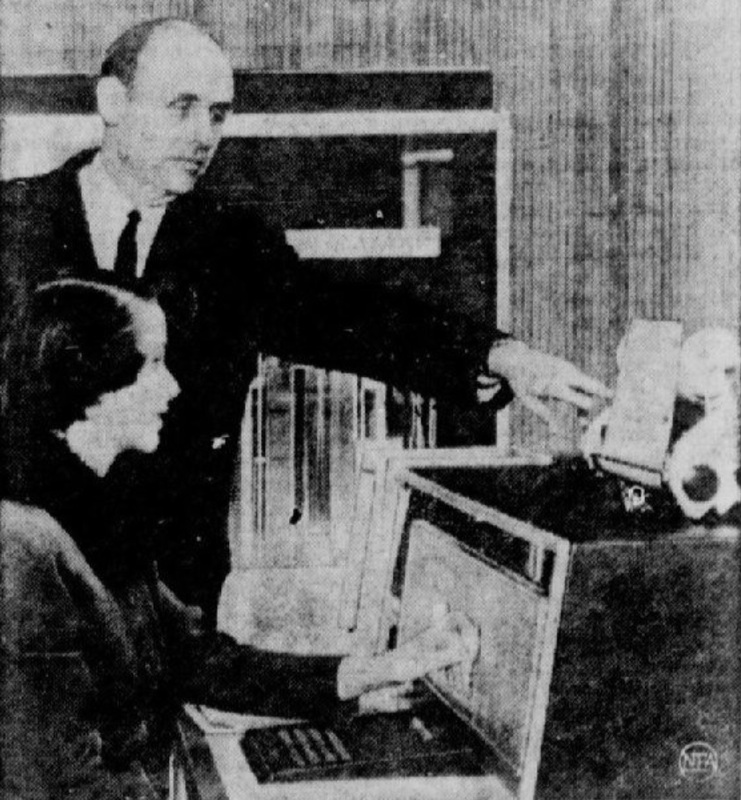 This system was the first machine of this type to be used by a Canadian insurance company – a piece of news that the Mouvement Desjardins proudly pointed out in the October 1960 issue of La Revue Desjardins. Would you believe that International Business Machines, the one in Don Mills that is, was apparently the first subsidiary of what was then Computing-Tabulating-Recording Company to bear the name International Business Machines? But back to our story. The Mouvement Desjardins was but one of the many organisations which jumped on the computer bandwagon in the late 1950s and early 1960s. United Air Lines Incorporated and the Mopar Division of Chrysler Corporation had IBM 305 RAMAC systems no later than 1957. The United States Coast Guard got one no later than the summer of 1960. That system was used to accelerate rescue operations. Using the longitude and latitude of a ship in distress, the system could identify all ships in the vicinity. Northern Electric Company of Mississauga, Ontario, may have operated an IBM 305 RAMAC system, in all likelihood the first in Canada, as early as 1957-58. The people behind the VIII Olympic Winter Game, held in 1960 in a place whose name is most inappropriate in the 21st century, or in any century, Squaw Valley, California, had an IBM 305 RAMAC system on site. This system calculated and printed the results of the competitions in real time, for the first time. You seem shocked, my reading friend. Don’t you know that, in previous games, all calculations had to be done by humans? Officials and competitors sometimes had to wait for hours for the results of a race. The first computers were human beings, very often female ones. Haven’t you seen the superb 2016 movie Hidden Figures, which told / tells the story of African American women who played a crucial, if hidden, role during the early stages of the American piloted space program? Given the time of its introduction, you may not be surprised to hear (read? ), my technically savvy reading friend, that the IBM 305 RAMAC system represented one of the last uses of vacuum tubes by IBM. Given that fact, given also how fast electronic computer technology evolved, evolves and will evolve, you may not be surprised to hear (read?) that a new transistorised system introduced by IBM in 1962 made the IBM 305 RAMAC system obsolete. The hard disk drive, on the other hand, lived on. The article you are reading today is a living and breathing testimony to that fact. This being said (typed? ), the sold state drive is replacing the hard disk drive for certain applications. A parting thought if I may. Professor RAMAC may have been the first example of the full-fledged personification of an electronic computer that culminated with HAL 9000, the world famous if utterly virtual character of 2001: A Space Odyssey, a 1968 movie mentioned in a July 2018 issue of our blog / bulletin / thingee. And yes, my reading friend who happens to love science fiction, one of the non electronic brains behind this movie classic was Arthur Charles Clarke, a gentleman mentioned in a November 2018 issue of our blog / bulletin / thingee. I now bid you farewell, until next week, in the hope that a new system will not render me obsolete before that date. Date. Date. Date. Date.